Reigning Italian Champion Giovanni Visconti has decided to remain with the ISD–Neri–Giambenini next season despite the major disappointment faced by the Pro Continental formation earlier this year. The team was overlooked for a start in the Giro d'Italia, which saw Visconti lose his chance to compete in Italy's biggest event. 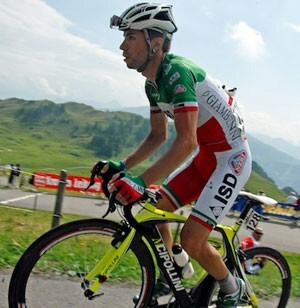 Climber Jose Rujano was brought on board to challenge for the overall title in the Italian race, and when the news broke, manager Luca Scinto was concerned about the team's future since they would not compete in the team's primary objective. Visconti was rumored to be leaving for a ProTour deal, but instead showed his confidence in the team by staying on board. With his move to a larger team, Visconti would be guaranteed a place in most of cycling's biggest events, but that is something that would have been at the expense of being the team's undisputed leader. “With Giovanni we had some tense moments," explained Angelo Citracca, "but now we are all happy about his decision. Visconti is a rider with a lot of potential, so it's normal that he would receive many offers. When the team was left off the start list for the Giro, they immediately changed their focus to the national championships. Visconti was able to secure the tricolore jersey for the second time in his career and, with his recent stage win at the Brixia Tour, the team will look to build on their recent successes. “I can only be happy about the choice of Giovanni. We have a busy year ahead of us, and I'm sure we can support him as he deserves," Scinto said confidently. "The tricolore is a success we achieved together, and our struggles of today and tomorrow will help us grow. 2011 will be the third year of this project, and with the tricolor we are ready to make another quantum leap."